Edge: Diagonally reeded. Click here for a sample of the edge. Comments: Listed as WA.1795.5 by Fuld and in Dalton and Hamer it is under Middlesex, Halfpenny section, no 283b. This is the large coat button variety. On the obverse note the small die crack at the rim from the F to the I on FIRM. This crack widened considerably over time as can be seen in the next example. A thin crack can also be seen from the T in THE moving down to the bottom serif in the N on WASHINGTON. Within his name slight die cracks also appear from the N through the center of the G and to the T and then another from the far end of the serif on the T to the O. There was also a void in the die causing a small metal blotch at the base of the bust, directly opposite the M in HUMANITY. Note that in the word PEACE the letter E was restamped and slightly realigned so that the lower vertical stroke is visible; also the C in PEACE was recut into the die. 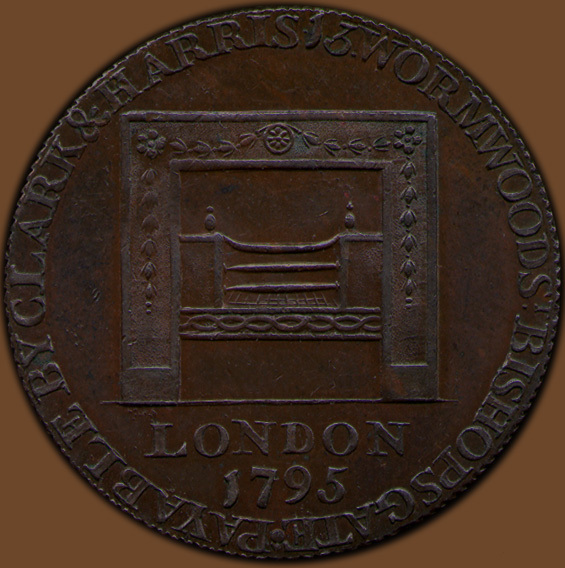 On the reverse these is a small die break as a dot following the S in HARRIS and the large stop following BISHOPSGATE has what appears to be a smaller die break dot between it and the rim. This well preserved example has a crisp diagonally reeded edge that gives the larger size images shown here a somewhat "saw toothed" edge appearance. According to Dalton and Hamer the reeded edge sometimes goes from left to right and sometimes in the opposite direction. In choosing a number from their catalogue I assumed they looked at the coin from front to back in determining the edge direction. 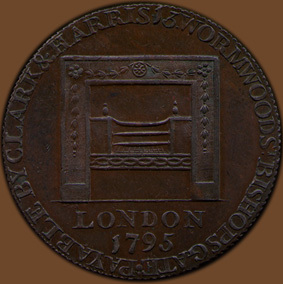 Comments: Listed as WA.1795.5 by Fuld and in Dalton and Hamer it is under Middlesex Halfpenny section, no 283b. This is the large coat button variety. 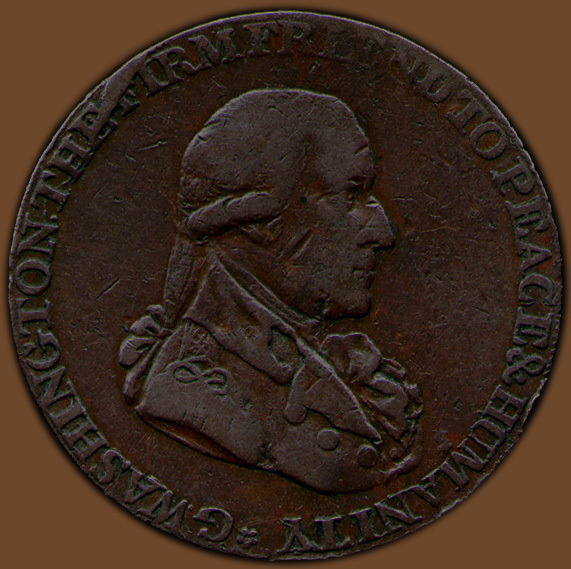 On the obverse note the rather thick die crack starting at the rim over the I in FIRM and going down through the E in THE, it then narrows to a thin line and continues to the T where it joins another die crack that goes from the top of the T to the bottom of the N and on the the base of the O in WASHINGTON (see previous example). Within his name slight die cracks also appear from the I through the center of the N and G and to the T (difficult to see on the scan); another very slight break is visible from the far end of the serif on the T to the O. There was also a void in the die causing a small metal blotch at the base of the bust, directly opposite the M in HUMANITY. 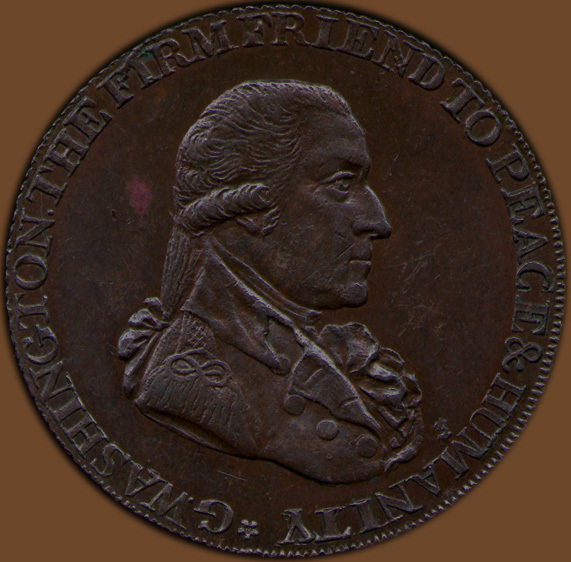 Note that in the word PEACE the restamped E somewhat noticeable and the recut C is evident. 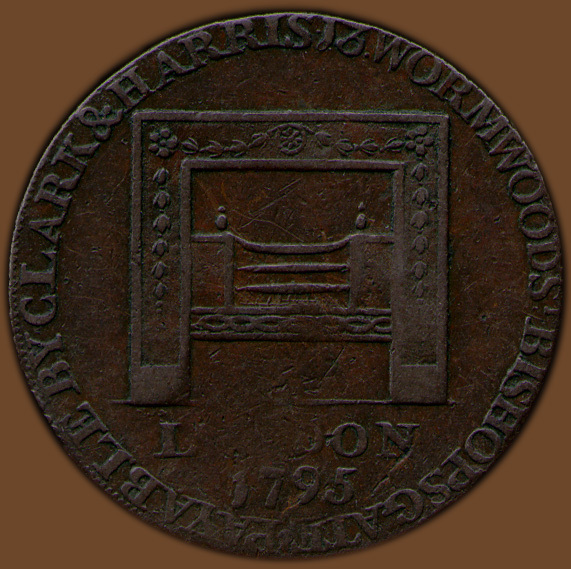 On the reverse these is a small die break as a dot following the S in HARRIS and the large stop following BISHOPSGATE has what appears to be a smaller die break dot between it and the rim. 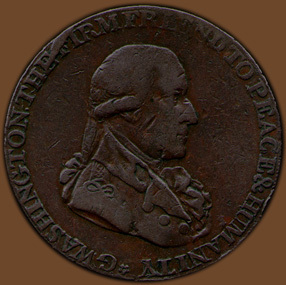 1795 Libery and Security Tokens Section Contents 1800 REBUB. AMERI.